My recent playthrough of the first scenario from VG's 1987 classic, Central America, was tons of fun. I really love how insurgents work in this game and how they can pop in and out of existence anywhere on the map. But one of my absolute favorite scenarios from this game (and maybe almost any other game) is Scenario 4, "The SS-20 Incident". 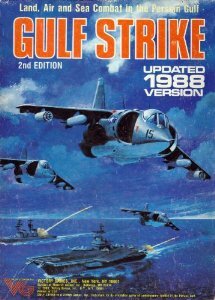 Only one turn long, this scenario pits the US Navy and Air Force against the Nicaraguans in an effort to destroy an intermediate range nuclear weapon that the Soviets have so helpfully provided to a hostile regime in the Western hemisphere. The Americans only get one turn to dismantle the Nicaraguan Air Force and then pave the way for Special Forces guys to parachute out of a C-130 and destroy the missile launcher, Eat your heart out, Michael Bay. The US gets a huge number of aircraft to start with but so do the Nicaraguans. In 1989, Avalon Hill released MBT , a design by James M. Day. Like its title heavily suggests, MBT was all about modern tank warfare. Set in Germany in the late Cold War period, MBT let players slug it out on a tactical level (100 meter hex, individual tanks and infantry squads) with the latest weaponry of the day. Fast forward 27 years later, and MBT is once again on our shelves - this time around published by GMT. With updated maps, counters, and scenarios, MBT has been loving revived and streamlined for today's gamers. I have never played the original MBT so I'm not sure what the exact differences are between the two versions, but if you're interested in a comparison, I suggest reading up on this thread over at BGG.